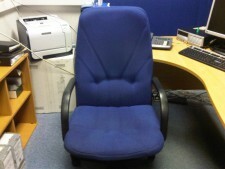 Chair cleaning is frequently overlooked by businesses and yet it is another way to impress customers and staff. In offices, everyone has their chair and they sometimes have them for years as they are ergonomically adjusted to suit them at their desk. When the chairs get old, they can start to look rather tatty as we can see here. Does someone in your office sit on a chair that looks like this? Ensuring the cleanliness of your upholstery in your reception area is another way that you can impress your customers from the moment they enter your premises. A comfortable and beautifully clean sofa for your clients to sit on whilst they wait to be seen is a great step towards making an excellent first impression. With our wide ranging capabilities in upholstery cleaning, we can provide a number of solutions which will help dramatically improve the look of your office chairs as we can see here. Whether your upholstery is fabric or leather, we have industrial strength, environmentally friendly solutions which we can tailor to your requirements. This chair and the office carpet were cleaned and helped brighten up the office for a new employee - what a great welcome to your new work place! 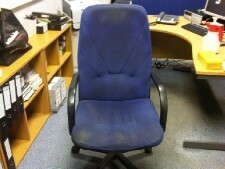 Save your business a fortune versus the cost of replacing chairs. "We would like to thank Hydro Kleen (Scotland) for the very professional service received. It was a pleasure to do business with them. The job was done extremely well and the finish was beyond our expectations. We have no hesitation in recommending Lindsay and his team in the future."